VietPress USA (April 7, 2018): President Donald Trump always said "You are fired!". Today, Trump Tower got fired at the 50th floor and caused 1 dead, at least 4 other people injured. According to Wikipedia, Trump Tower is a 58-story, 664-foot-high (202 m) mixed-use skyscraper at 721–725 Fifth Avenue between 56th and 57th Streets in Midtown Manhattan, New York City. Trump Tower serves as the headquarters for The Trump Organization. Additionally, it houses the penthouse condominium residence of the building's namesake and developer, U.S. President Donald Trump, who was a businessman and real estate developer when the tower was developed. Several members of the Trump family also live, or have resided, in the building. The tower stands on a plot where the flagship store of department-store chain Bonwit Teller was formerly located. Der Scutt, of Poor, Swanke, Hayden & Connell designed Trump Tower, and Trump and the Equitable Life Assurance Company (now the AXA Equitable Life Insurance Company) developed it. Although it is in one of Midtown Manhattan's special zoning districts, the tower was approved because it was to be built as a mixed-use development. Trump was permitted to add more stories to the tower because of the atrium on the ground floor. There were controversies during construction, including the destruction of historically important sculptures from the Bonwit Teller store; Trump's alleged underpaying of contractors; and a lawsuit that Trump filed because the tower was not tax-exempt. Construction on the building began in 1979. The atrium, apartments, offices, and stores opened on a staggered schedule from February to November 1983. At first, there were few tenants willing to move in to the commercial and retail spaces; the residential units were sold out within months of opening. Since 2016, the tower has seen a large surge in visitation because of Trump's 2016 presidential campaign and subsequent election—both his 2016 and 2020 campaigns are headquartered in the tower. 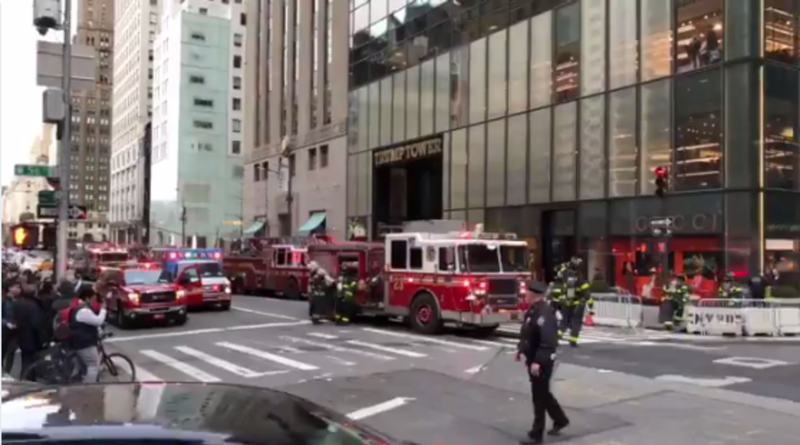 At least one person died and four others were injured after a fire broke out in Trump Tower in New York City on Saturday, police and fire officials said. The FDNY previously said that one person who was inside the apartment was critical, adding that four firefighters also were hurt. "We found fire on the 50th floor of the building," FDNY Commissioner Daniel A. Nigro said. "The apartment was entirely on fire. Members pushed in heroically, they were knocking down the fire and found one occupant of the apartment who is in critical condition." 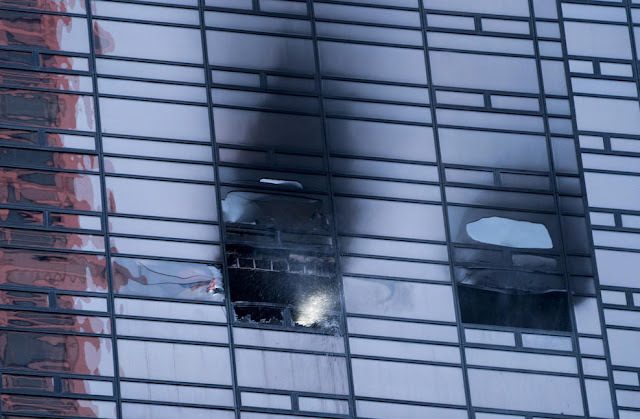 Nigro went on to describe the fire as "difficult" and said the high rise "had a considerable amount of smoke." 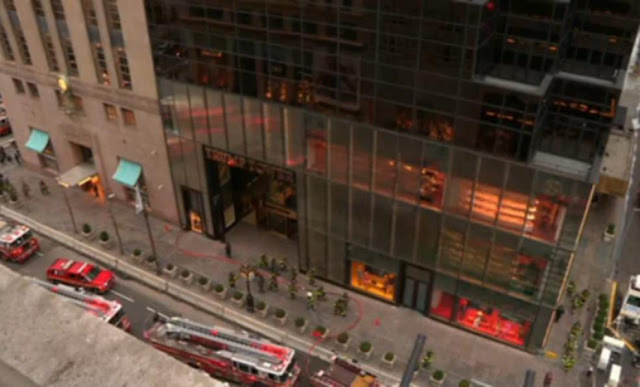 The FDNY's alert system tweeted that the blaze was "under control." The cause of the fire was unclear. Video on social media showed orange flames and smoke billowing from the building. Sirens could be heard in the background. 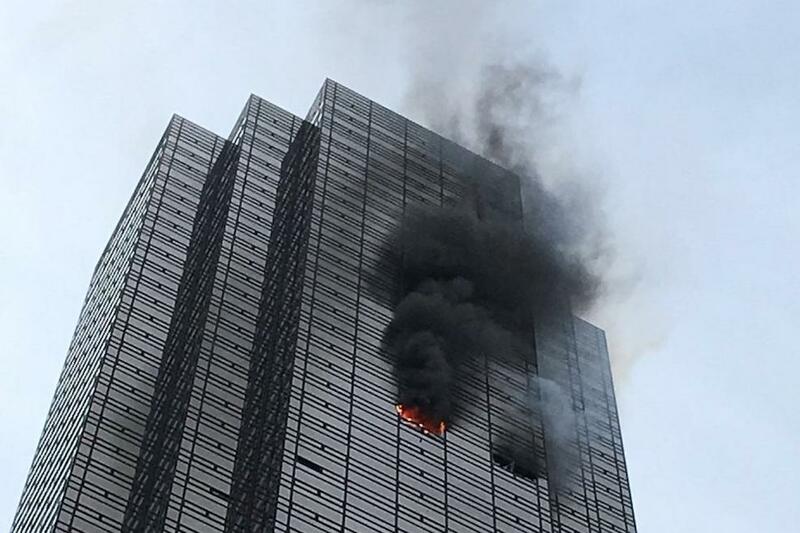 President Trump tweeted shortly after the incident, saying the fire at his namesake high-rise "is out." "Very confined (well built building)," he tweeted. "Firemen (and women) did a gret job. THANK YOU!" The blaze was described by the FDNY’s alert system on Twitter as a 4-alarm fire that erupted on the 50th floor of the high rise on 5th Avenue in Manhattan. They initially had called it a 2-alarm fire. Trump was at the White House on Saturday; a spokesperson said first lady Melania Trump was in Washington as well. Several firetrucks, as well as police officers and responders, could be seen near the entrance of the building. Police said that a number of nearby streets were closed. Trump's son, Eric, also tweeted, thanking "the amazing men and women of the NYFD who extinguished a fire in a residential apartment @TrumpTower." Thank you to the amazing men and women of the NYFD who extinguished a fire in a residential apartment at @TrumpTower. The @FDNY and @NYPD are truly some of the most incredible people anywhere! "The @FDNY and @NYPD are truly some of the most incredible people anywhere!"